Huei Young's gardens are a reflection of her interest in nature, harmony and tranquility. The inspiration of her gardens was her father, who, unable to create a large garden in the limited space available where they lived in Taiwan, expressed his love of form, nature and scenery in his calligraphy and paintings. It was Huei's hope to create an Asian garden that her father could visit and enjoy. Unfortunately, he passed away before the garden was completed. 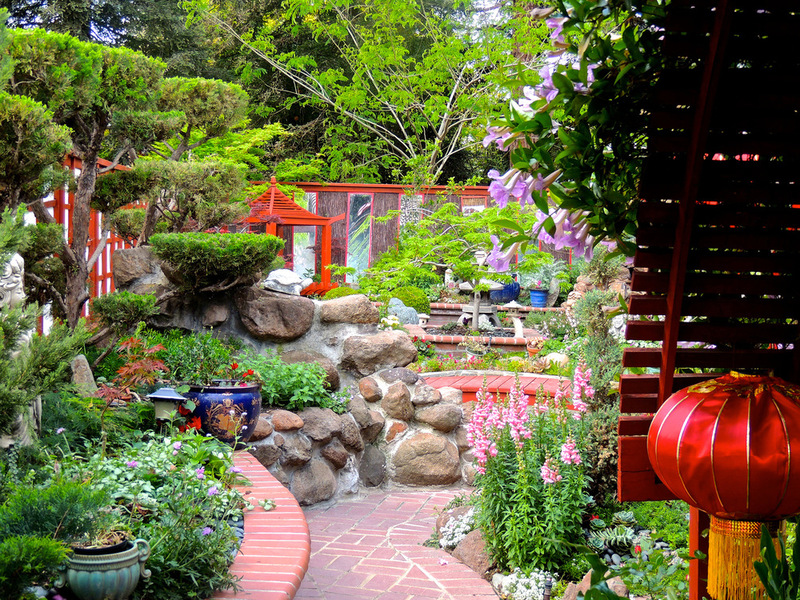 The garden at her Davis home has been the site of numerous fund-raisers for non-profit organizations and it is there that she prepared and hosted a luncheon for dignitaries from Wuxi, Davis's sister city in China. Huei is well known for her Chinese culinary skills, which she shares once a month in a cooking for Davis Community Meals. Guests are always amazed that such an oasis of beauty and exquisite design exists within a residential area. At both homes, the one in Davis and Palo Alto, Huei's goal is to create an atmosphere in which the home is an integral part of the garden and she accomplishes this through the principles of Feng Shui, by incorporating wood, stone, mirrors and natural colors throughout. Large, expansive windows pull the atmosphere of the garden into the home. So many people pass by the city garden on the greenbelt next to my house. Hundreds of joggers, strollers, and bicyclists pass by each day. They say it brings them peace and tranquility. They tell me that it is the only greenbelt section in Davis maintained by the nearby homeowner year after year. The city irrigation boss approached me in 1980 because there was a problem with kids throwing soda cans in the water ditch leading to the storm drain. He said if the area looked nicer, they probably wouldn't do this. I said I would see what I could do, so they gave me a letter with permission to improve the area. I started the project in the early 1980s. First I changed the soil and started to redesign it with new plants, boulders and rocks. I focused on this project. During these years working with the city garden, I also began creating my dream Oriental garden. People have different ways of having fun, but my fun is creating something beautiful to share with the world. The city greenbelt garden has become famous, with local people bringing visiting friends from all over the world to enjoy it. As long as I am here the garden will be pretty all the time. A delegation from Wuxi, the Chinese sister city of Davis, made it their first stop when they came to visit Davis. The Consul General of China from the San Francisco office and his delegation came and spent hours enjoying the garden. 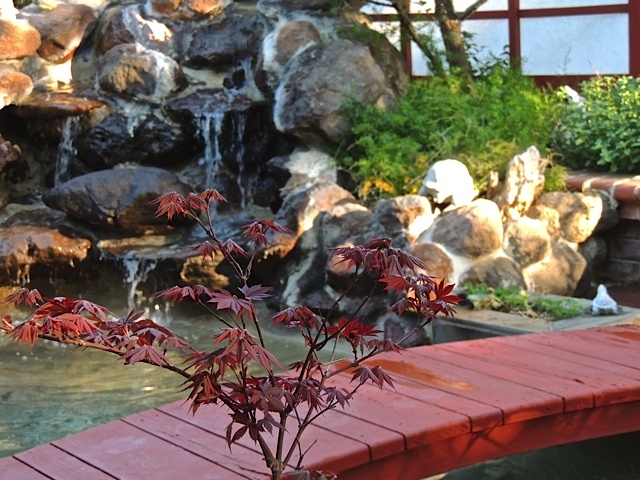 The garden reflects both a Chinese and Japanese influence, with a combination of wood, stone, water and plant features. I have offered my garden for fundraisers since 2003. It has raised money for the Pence Gallery, MVT's eye testing and glasses program for children in need, Youth in Focus, STEAC, which is a short-term assistance program, Yolo Hospice and Shriners Hospital for Children's Cerebral Palsy Program, which will benefit from this garden tour. I have received the support of Good Day Sacramento, the Davis Enterprise and the Sacramento Bee many times. For the Chinese community, I have been interviewed by a Bay Area Chinese-language cable station and had articles about my garden appear in the largest Chinese language newspaper in America, The World Journal. Years ago, someone visiting from China brought me a copy of an article about my garden that, unknown to me, had appeared in a Chinese landscape architecture journal. My garden tour for Shriners Hospital is on April 28th, but if you cannot make it, you can always visit the city green belt adjacent to my home at 234 Luz Place, or visit my website: http://www.hueisgarden.com where you can find more about the tour and history. Individual groups can arrange for tours at other times. If you visit the Davis Library, you can see the book "Great Gardens in Small Spaces," which features my garden as the first one. Davis Enterprise columnist Bob Dunning graciously encourages people to come to my garden tour each year. WELCOME TO HUEI'S Garden in 2019 -- the year of the Pig!